This easy lemon fudge recipe is so amazingly good. It’s tart and sweet and incredibly creamy. Plus it’s super easy to make in the microwave using just 2 ingredients. Do you love lusciously creamy lemon meringue pie? Yes! 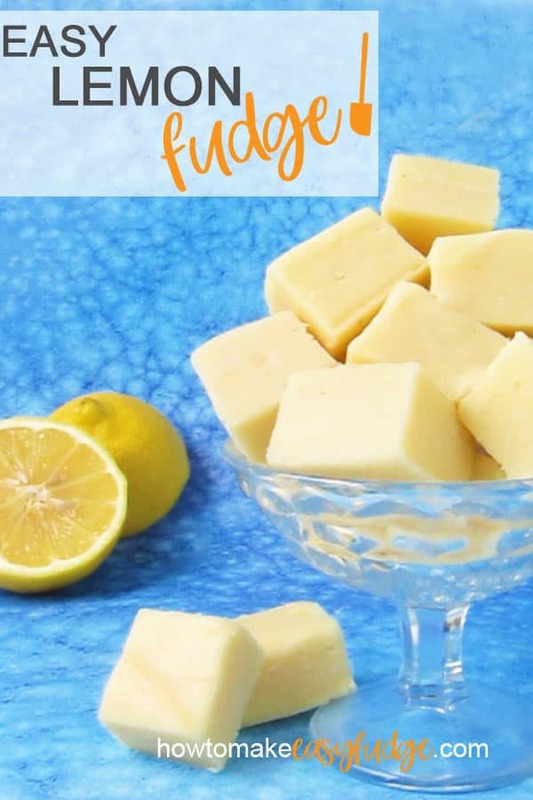 Well this lemon fudge, bursting with lemon and creamy vanilla flavor, will definitely be one of your favorite recipes here at How To Make Easy Fudge. It is so good and so easy to make. No need to peel, zest, or even squeeze a lemon to make this easy lemon fudge. You simply melt white chocolate chips and some store bought lemon curd together in the microwave. You will be so impressed with how amazing this fudge tastes. I am sure! I am not a huge fan of lemons because they are just too sour for me but I do love lemon flavored dessert like this Lemon Lush and this lemon fudge. The sweet fudge had me going back again and again to grab another piece. The lemon flavor is really intense in this homemade candy but the undertones of vanilla cream from the white chocolate make it so beautifully balanced. It’s uniquely refreshing and has a pretty pastel yellow color so it would make a lovely dessert to serve at a spring or summer party. It would also make a wonderful gift along with some pretty pastel Orange Creamsicle Fudge or Strawberry Fudge. What makes this lemon fudge easy to make? It’s made with just 2 ingredients: white chocolate chips and lemon curd. Lemon curd is a creamy smooth, intensely flavored, somewhat tart, somewhat sweet, cross between a lemon jelly and a lemon custard. Lemon curd is made using egg yolks, butter, sugar, and real lemon juice. You can make homemade lemon curd on the stove or in the microwave or you can just buy jars of it at the grocery store. 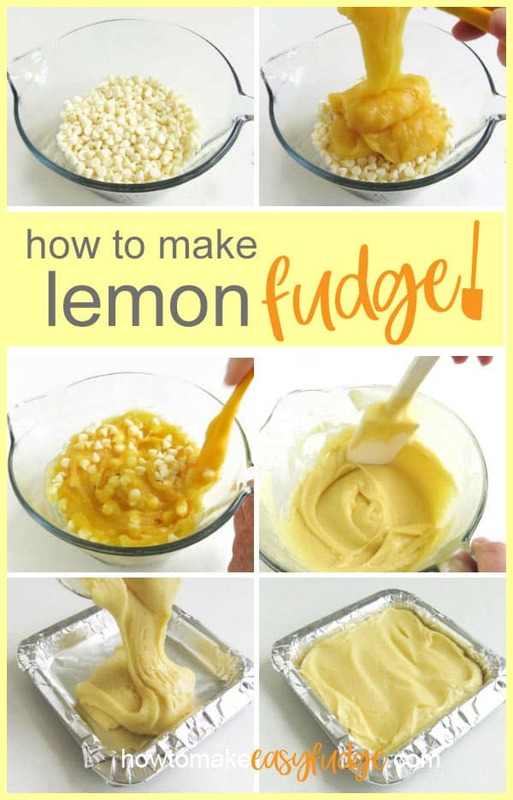 How to make easy lemon fudge. Stir lemon curd into white chocolate. Heat at 70% power for 90 seconds then let the bowl rest in the microwave for about 3 minutes before stirring. If all the white chocolate doesn’t melt, let it rest a few more minutes then stir again. If needed, heat for 15 seconds at 70% power and repeat the process above. Pour into a lined pan. That’s it! This lemon fudge is seriously so easy to make and it has such a lovely flavor. No one will ever guess it took you less than 10 minutes to make it. Can I use store-bought lemon curd for this lemon fudge recipe? I use jars of lemon curd because I am all about making easy fudge recipes and there’s not much easier than simply melting two ingredients together to make this microwave lemon fudge. Would I say it’s worth the effort to make it homemade? Yes, if you are making a pie or tart, but no if you want to make this easy fudge. When developing this recipe I tried it both ways: with homemade lemon curd and with a jar of lemon curd. The flavor differences in the fudge were barely detectable. 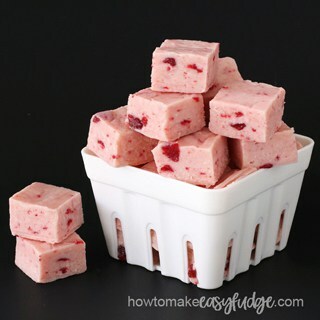 I shared this fudge with over a dozen friends and family and they loved both versions. I used Dickinson’s Lemon curd in a jar because I can easily find it at Kroger and other grocery stores and it is quite thick which works really well for this recipe. You will need about 1 1/2 jars (10 ounces each) to make this recipe. If you do make homemade lemon curd which will be much thinner than what I used or you buy a jar that contains really thin lemon curd you might want to add an additional 3 ounces of white chocolate (1/2 cup of chips) to the recipe in order to get this homemade lemon fudge to set up properly. What type of white chocolate should be used to make lemon fudge? 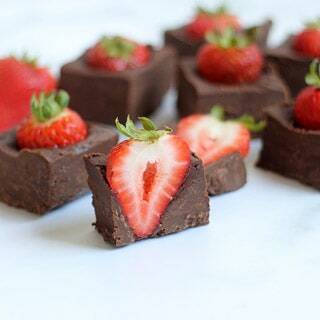 I developed this recipe using Nestle Premier White Chips which made a wonderfully flavored fudge. Nestle white “chocolate” chips, are actually considered a confectionery coating because they are made using a vegetable oil (palm kernel oil) instead of cocoa butter which is used to make pure white chocolate. 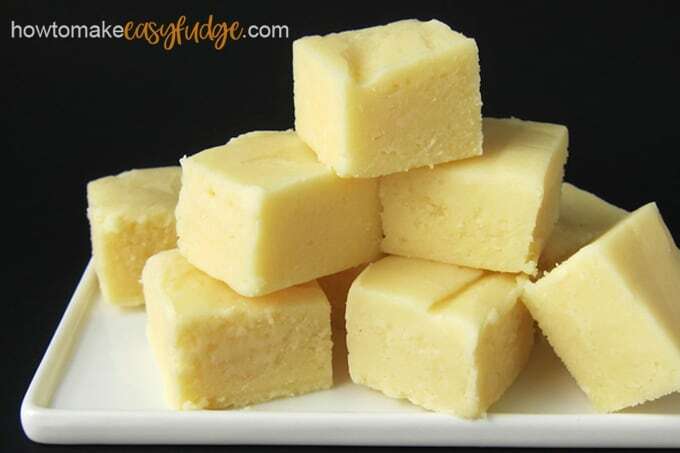 You can use pure white chocolate chips to make this fudge but know that the lemon flavor will not be quite as intense because the flavor of the cocoa butter will mute the lemon flavor slightly. You can also use other types of white confectionery coating like White Candy Melts, White Almond Bark, Ghirardelli White Melting Wafers, or Peter’s Ice Caps (one of my personal favorites). Can I use real lemons or lemon extract to flavor my fudge? I really love that this fudge is essentially flavored with real lemons being lemon curd is made with real lemons. If you want to use fresh lemons to make this lemon fudge, then you will need to make lemon curd first. You could make lemon fudge by adding lemon extract to our vanilla fudge recipe if you can’t find lemon curd, but that fudge won’t have the same flavor. You can find the Nestle White Chips or Peter’s Ice Caps and the lemon curd in a single jar or multi-pack on amazon (commission earned for sales). 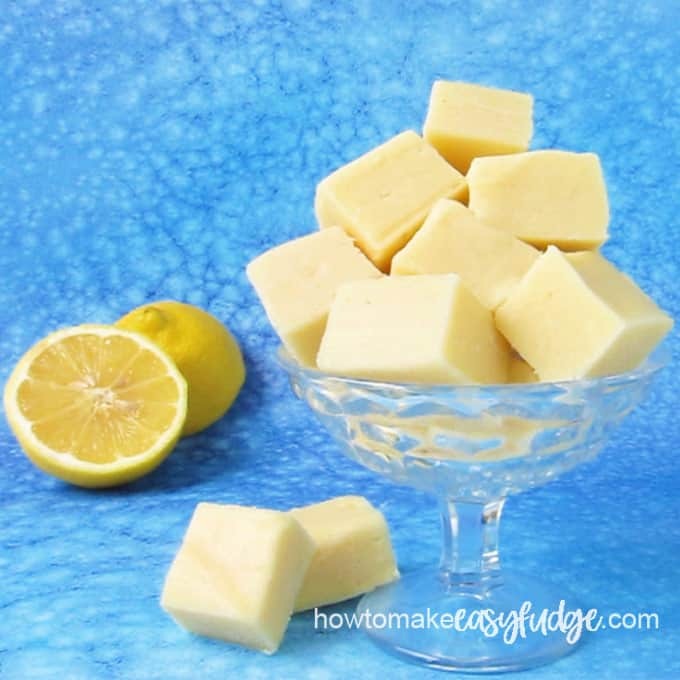 Watch this video tutorial to see how quick and easy it is to make homemade lemon fudge. Enjoy this refreshingly sweet and slightly tart Lemon Fudge for dessert on a warm spring or summer day. Line an 8 inch square pan with non-stick tin foil or parchment paper or regular tin foil sprayed lightly with baking spray. Pour the white chocolate chips and the lemon curd into a microwave safe mixing bowl. If needed, heat for another 15 seconds at 70% power. Let rest, allowing the residual heat in the fudge to melt any remaining chips, then stir until melted. Chill in refrigerator for about 3 hours until firm. I know you will enjoy making and eating this sweet and tart lemon fudge. 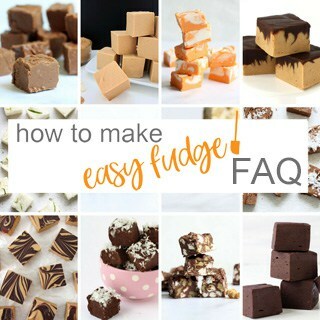 If you have any other questions about making fudge, be sure to check out our Easy Fudge Recipe FAQ. There you will get tips and tricks for choosing the right pans, lining pans, making and storing fudge, and more. I never thought to put lemon curd in a fudge recipe, but this turned out SO great! Perfect amount of lemon Thank you! I’m so glad you enjoyed this lemon fudge!!! Yumm! Such a great summer recipe! This fudge is so refreshing and is perfect for summer. Would it work to grate some lemon rinds into the mixture just before the final stir (after it’s been cooked) to add some lemony “chunks” to the final product? I made some dark chocolate and raisin fudge in a similar way and the added texture is quite interesting. 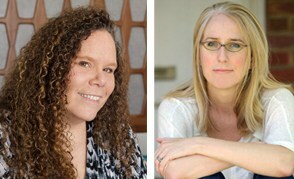 Thanks Leigh! This fudge is really good and can be made using homemade lemon curd if you can’t find reasonably prices jars of it in the store. Adding some lemon rind would be really nice. It would enhance the lemon flavor and add little flecks of color to the fudge which would look nice. I hope you enjoy this fudge! I can’t believe how good this fudge is made with just 2 ingredients. I brought home some lemon curd from a trip we took to Ireland and I used it to make this fudge. Everyone loved it!!! I’ll be making this again and again and again. Thanks for such an easy recipe. We are so glad you like this easy fudge recipe. Using good lemon curd will definitely give you outstanding flavor. Enjoy making this again! My family loved this fudge so much that I’m making it for Easter. I’m cutting it into little eggs then adding beaks, eyes, and feet to make it look like little chicks. 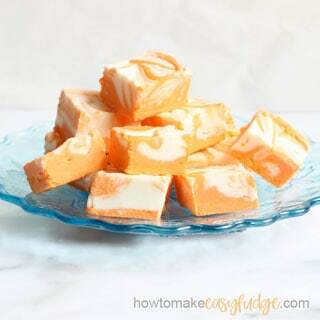 I saw some similar treats on your Hungry Happenings site and thought it would be fun to decorate this lemon fudge. Have a happy Easter!